This week we've got a rework for the duel arena that will make everything that happens at the arena safer and quite a bit faster. This includes a rework of both the challenge screens and the ability to save and load duel rule presets! The duel arena is a brilliant place to risk some cash and have some fun. 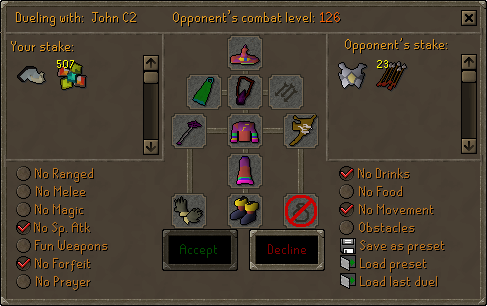 To make the duel arena both safer and a more enjoyable place, we have reworked the challenge screens to make the process of setting up a duel quicker, easier and more scam-proof. It is now possible to save and load a chosen set of rules for duels. When on the challenge screen, pick the rules you would like to create a preset for and click the 'Save as preset' option. You will then be able to load these rules at the click of a button using the 'Load preset' option. It is also possible to choose to use the same rules as your previous duel. Simply click the 'Load last duel' option. Scamming has, unfortunately, been a problem at the duel arena for as long as the duel arena has existed. 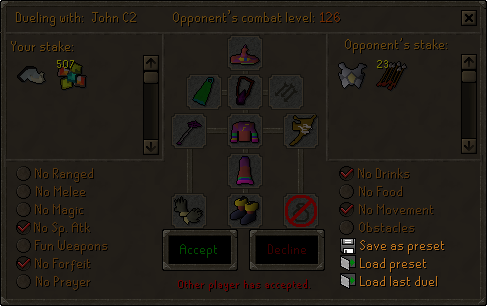 With the duel arena revamp we have added a number of anti-scamming measures that make some of the most common scams at the arena impossible. When a change is made to the rules the 'Accept' button cannot be clicked for a few seconds. This means that it is impossible to quickly change the rules and trick your opponent. This is also triggered by changes to the items being staked. One other large change is the redesign of the second screen. The second screen that appears when starting a duel has been given a makeover. It now provides much more information about what the duel you are potentially entering will entail. You can see exactly what rules are set including specifics about which equipment slots are enabled. 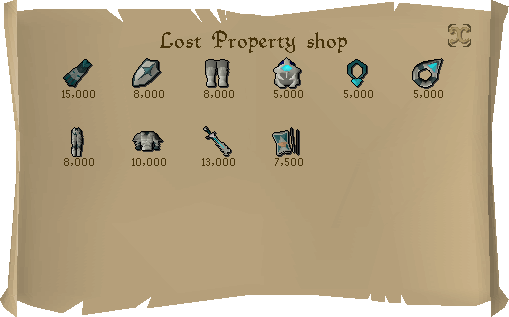 Perdu, the dwarf found upstairs in Edgeville general store, will now sell you back any achievement diary gear that you may have lost. The top two floors of the Lumbridge castle tournament arena map have been removed to prevent players repeatedly going up and down the stairs to lengthen games. The Pyramid Plunder timer overlay now increments more reliably when switching between graphics modes. You can now look inside the Kalphite Queen's chamber when a rope is attached to the tunnel entrance. Fixed misspelling of "receive" in Ardougne, Karamja, Morytania and Wilderness Diaries. Moved some invisible walls on the Lumbridge Castle Clan Wars map. The poll booth history display has been rewritten to accommodate more polls without crashing. This feature will be made accessible once further testing has taken place on the live game worlds. The dragon chainbody and dragon chainbody (g) no longer render through the Ardougne cape. The message stating that you have received more runes from the Barrows as result of the hard tier of the Morytania achievement diary will now only appear once. Added left-click farming options to the Kelda hops patch. Ensured that maximums of coal and tin of 254 are enforced in the blast furnace. The female pirate hat & eye patch now sit in place with a female character's head. Ahrim's hood no longer clips through a female character's neck. The slayer helm now connects to a female character's neck line. 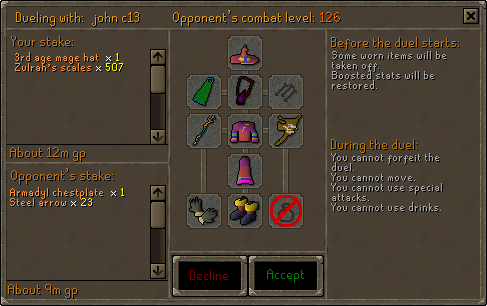 Hopefully the Duel Arena rework reduces scamming. However, I have noticed a proliferation of spam bots there recently. Also, when can we expect to see a poll question regarding the introduction of a max cape? OSRS has 100 maxed players now. E: in that picture of what Per*u sells back now, there are no Karamja gloves. he'll sell those back though as well, right? Sweet, keep the updates coming. When will you poll/discuss dragon claws? Most of the opposition came from a jmod who is no longer employed. 100 players have Maxed on oldschool recently. I heard you guys would starting looking into Max cape when 100 players have maxed. Will that be anytime soon?